EFI Hardware billet throttle bodies on a 6 Rotor on the Dyno! 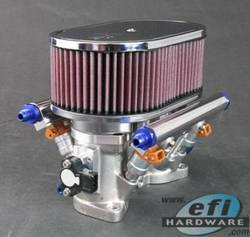 Here's an "extreme" example of EFI Hardware billet throttle bodies on a 6 Rotor! IDA Plenum Chamber for Turbo Rotary Applications. 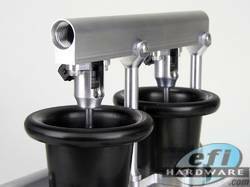 Choose 50mm or 55mm inlet on an EFI Hardware IDA throttle bodies. Beautifully welded and polished aluminium. Mounting Plates can be rotated to point the intake over the engine, or away from the engine. 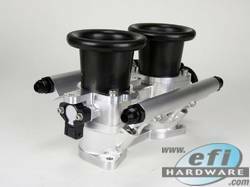 The E-Series Throttle Bodies are made with a budget in mind. These are available with limited options. They come only in 50mm Bore with no anodizing options. Fuel rails are to suit 14mm Oring full length Injectors. They are available in wide and narrow spacing. NOTE: As these E-Series throttles do not incorporate seals on the throttle shafts we do not recommend their use for boosted applications. Weber IDA style Throttle Bodies with choice of 50mm & 55mm parallel bore size, or 55/53/50mm tapered bore with high flow shaft and fasteners. 55mm inlets have the option of special high flow profile ram tubes for extra power gains. Tapered Bore IDA are now BILLET!! 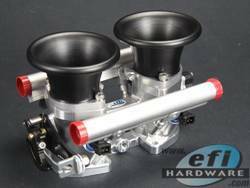 Weber IDA style Throttle Bodies with K&N Air Filter, and a choice of 50mm & 55mm parallel bore size, or BILLET 55/53/50mm tapered bore with high flow shaft and fasteners. 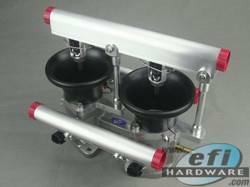 Weber IDA style Throttle Bodies with Air Box, and a choice of 50mm & 55mm parallel bore size, or 55/53/50mm tapered bore with high flow shaft and fasteners. Billet IDA - 60mm Ram Tubes and Throttles with Tapered bore to 55mm at the manifold flange face. -8 AN fittings Not included. 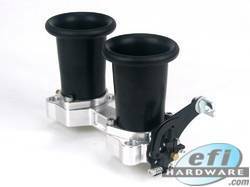 This kit allows you to hi-mount 2 half height extended nose injectors to your IDA Throttle Body. NOTE: Kit does not include injectors or throttle body. This External Fuel Injector Rail is designed to mount on top of our 60mm Billet IDA Throttle Body - allowing you to mount 2 additional Hi Flow Fuel Injectors. NOTE: This product does not include Ram Tubes, Throttle Body or Fuel Injectors. 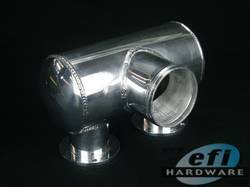 They are only included to give you an understanding of how this product mounts to a throttle body. This Mazda 20B ITB Pro-Race Kit enables all three runners to be equal length and parallel for optimum and equal flow to each rotor. Weber IDA style Throttle Bodies with choice of 55mm parallel bore size, or 55/53/50mm tapered bore with high flow shaft and fasteners. Both sizes use special High Flow profile ram tubes for extra power gains. Billet 20B KIT - 60mm Ram Tubes and Throttles with Tapered bore to 55mm at the manifold flange face. Fuel rail fittings Not included.